If you don't agree to the Form 4549 changes, the IRS will issue a Notice of Deficiency to you. This means you must petition Tax Court within 90 days of the notice mailing. DO NOT CONTACT THE IRS - They don't have the power to help you, even if the letter invites you to contact them!! Your only remedy is to petition Tax Court. But, a petition to Tax Court is often the best remedy for tax contests! The TaxHelpLaw Tax Attorney, J. David Hopkins, JD, LLM can guide you with legal advice or representation! 1. If this is the 1st notice you have ever received from the IRS because prior mailings to you from the IRS were lost or mismailed, your problem may be resolved with simply filing a few documents, but we always have the option to petition Tax Court. Contact TaxHelpLaw.com for details! 2. But, in most cases, you must petition Tax Court and file a Designation of Place of Trial. The IRS will answer in 60 days and then the case is transferred to IRS Appeals to try and resolve it. See Letter 4141. These Appeal conferences are more favorable to you because now the IRS knows it must resolve the case or answer to the judge!! Income Issues: The IRS will examine your Wage & Income Transcripts, your bank accounts & your lifestyle to determine if your reported income was accurate. You can get your Wage & Income transcripts from the IRS Agent, from Appeals once you've filed a Tax Court petition or by calling the IRS at 1-800-829-1040. The IRS will assume that all deposits into your bank accounts are income unless you can prove otherwise, which is very tedious. Fortunately, the TaxHelpAudit Program makes the task easy with a section titled "Proving Deposits are Not Income". Deduction Issues: More commonly, the IRS disallows all (or a major portion) of your deductions but gives you very little explanation for the denial. Usually, it's because your records are not organized properly or are insufficient to prove the case. The IRS won't review records that are not prepared properly as the TaxHelpAudit Program will show you. The evidence required to prove your case is more than just a few cancelled checks, receipts, or even an accounting software program. You will have to gather & properly arrange evidence of titles, insurance, purchase & transaction documents, vital records, school & medical records, court & public documents, etc. So, regardless of who handles your case or what tactic you choose, you still must present your records to the IRS according to the TaxHelpAudit method of preparation. Otherwise, even the Tax Court will deny your claims. TaxHelpAudit gets you prepared - TaxHelpLaw is your guide & advocate! Lost Documents: You may fear a IRS audit because you didn't keep your records or your records are lost or unavailable. However, unless you only used cash, bank records & credit card records can be re-created. Also, even if cash was used, affidavits can be obtained or we can use industry standards to arrive at a reasonable figure. 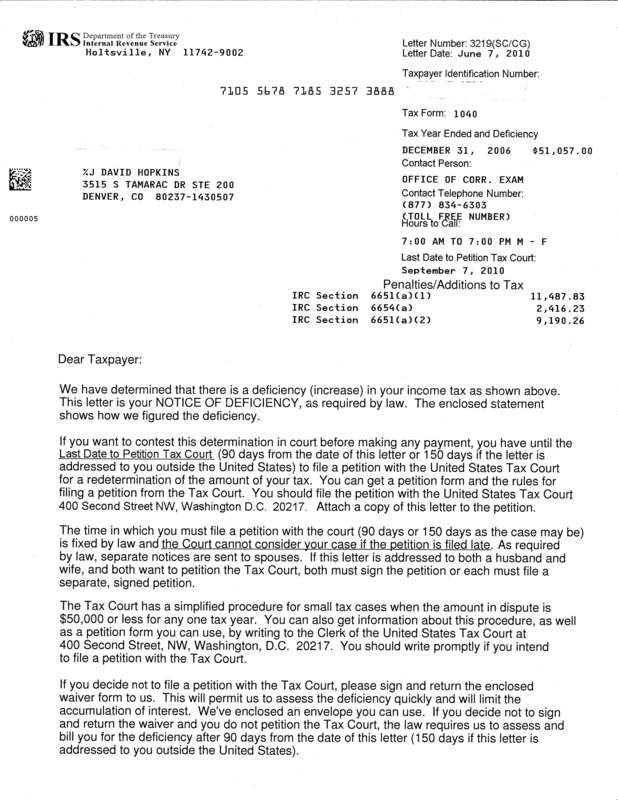 See TaxHelpLaw - Lost Documents.